Monetel - LISA 1 (8-11.11.2007) - 61 Salon Philatelique d'Automne - Paris 2007. Mint blank label. Monetel - LISA 1 (8-11.11.2007) - 61 Salon Philatelique d'Automne - Paris 2007. Mint TEST label. Monetel - LISA 1 (8-11.11.2007) - 61 Salon Philatelique Automne - Paris 2007. ATM small value (E 0,49 EUR), with commemorative postmark + original receipt of the vending machine, date of the 1st day of issue ! Monetel - LISA 1 (8-11.11.2007) - 61 Salon Philatelique d'Automne - Paris 2007. Mint ATM small value (0,49 EUR). Monetel - LISA 1 (8-11.11.2007) - 61 Salon Philatelique d'Automne - Paris 2007. Mint ATM small value (E 0,49 EUR) + original receipt of the vending machine, date of the 1st day of issue ! Monetel - LISA 1 (8-11.11.2007) - 61 Salon Philatelique Automne - Paris 2007. 4 mint ATMs small value (E 0,49 EUR) + 4 original receipts of the vending machine with the 4 languages, and date of the 1st day of issue ! Monetel - LISA 1 (8-11.11.2007) - 61 Salon Philatelique Automne - Paris 2007. Card with ATM and receipt, signed by the ATM and postmark designers. Monetel - LISA 1 (8-11.11.2007) - 61 Salon Philatelique Automne - Paris 2007. First Day Cover posted to Spain with ATM (P 0,60 EUR) + original receipt of the vending machine, date of the 1st day of issue ! Monetel - LISA 1 (8-11.11.2007) - 61 Salon Philatelique Automne - Paris 2007. 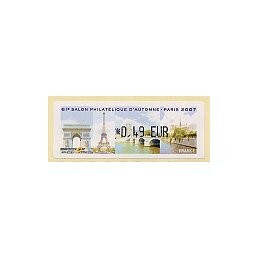 First Day Cover with ATM (E 0,49 EUR), commemorative postmark 61 Salon Philatelique d'Automne and receipt of the 1st day of issue ! Monetel - LISA 1 (8-11.11.2007) - 61 Salon Philatelique Automne - Paris 2007. 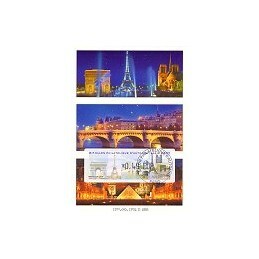 First Day Cover with ATM (E 0,49 EUR), commemorative postmark France - Groenland and receipt of the 1st day of issue ! 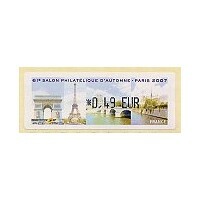 Monetel - LISA 1 (8-11.11.2007) - 61 Salon Philatelique Automne - Paris 2007. 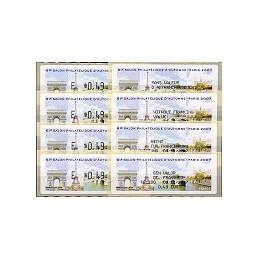 Maximum card with the different monuments, with ATM (0,49 EUR) and postmark Salon Philatelique Automne, date first day of issue. Monetel - LISA 1 (8-11.11.2007) - 61 Salon Philatelique Automne - Paris 2007. Mint set 4 values - shipment types (E 0,49 - 0,54 - P 0,60 - LETTRE 0,86 EUR) + 4 original receipts of the vending machine, date of the 1st day of issue ! Monetel - LISA 1 (8-11.11.2007) - 61 Salon Philatelique Automne - Paris 2007. Mint set 4 values - postal zones (E 0,49 - 0,54 - P 0,60 - P 0,85 EUR) + original receipts of the vending machine, date of the 1st day of issue ! RCM-FNMT (12.06) - 2006. Año de la memoria histórica - J. Carrero + Estudio Jesús Sánchez (2006. Year of the historical memory - J. Carrero + Estudio Jesús Sánchez). 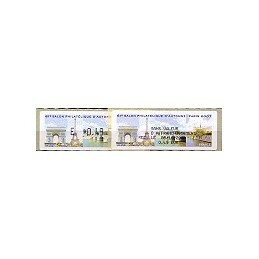 2 strips of stamps on thermal papel - sets 3 values (2 x 0,29-0,57-0,78 €) - Issue SF - Philatelic Service. Special postmark Salon Philatelique d'Automne - Paris.